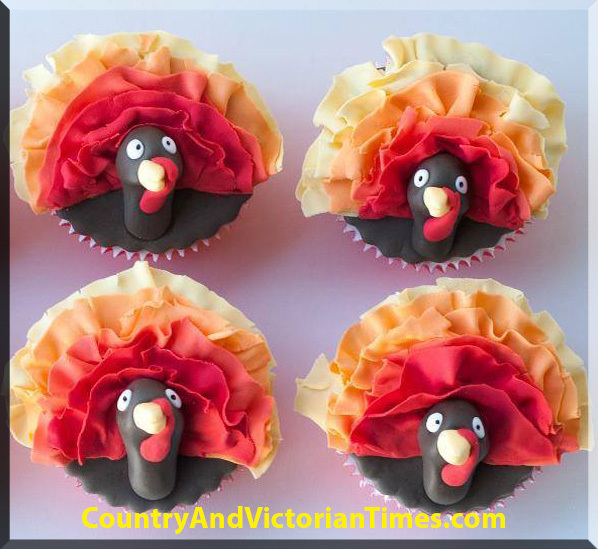 These turkey cupcakes are so cool to make for Thanksgiving and even though they look like a whole lot of time went into them it was simpler then you think. ~Make you favorite cupcakes and cool. ~The head – the picture shows fondant being used but lets use half of a Nutter Butter cookie dipped into the melted chocolate and then leave to dry on the side. ~Start with yellow icing and make a rippled edging along one half of the cupcake. When done squeeze the icing back into a bowl and add more coloring to that icing to get layers of yellow, yellow-orange, orange, orange-red, red, and a maroon color (by adding a very small amount of black or purple food coloring to the red). ~Top with Nutter Butter cookie that has pipped eyes, nose and goblet. Would be great for an extra special treat for your Thanksgiving dinner party – the kids will especially love them. This entry was posted in Crafts ~ DIY ~ Projects, ~Edible, ~Thanksgiving and tagged cake, cakes, chocolate, Chocolate chip, cook, cup, cupcake, cupcakes, Icing (food), Nutter Butter, Thanksgiving dinner, turkey, ~Home, ~Party. Bookmark the permalink.